Roger and Julie Kett welcome your stay at Picton TOP 10 Holiday Park, with its great location and proximity to the Interislander ferry terminal. Set at the head of Queen Charlotte Sound in the Marlborough Sounds at the top of the South Island, Picton is also the Interisland ferry terminal for travel across Cook Strait to Wellington. At Picton TOP 10 Holiday Park in Picton New Zealand, you'll find a full range of accommodation options to suit your needs including powered campervan sites, comfortable cabins and fully equipped self contained units. Relaxed and comfortable, Picton TOP 10 Holiday Park is the perfect place from which to enjoy the magnificent Marlborough Sounds. Kaikoura Top 10 Holiday Park offers you a warm welcome to this maritime wonderland. We have a modern award-winning Park with accommodation options to suit every budget, with excellent facilities for a superb vacation or an overnight stay. Come and stay with us at, Blenheim Bridge Top 10 Holiday Park. Where there is a bed for every budget. 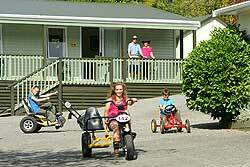 Okiwi Bay Holiday Park & Lodge is a small, friendly holiday park and lodgeLocated on the western side of the Marlborough Sounds facing Tasman Bay in peaceful Okiwi Bay. This is the perfect setting for a relaxed or active holiday. Explore the native bush or rugged coastline, laze in one of the many secluded bays or enjoy the riches of the sea with excellent fishing, scalloping and diving. If you desire the space, peace and the clean country air, situated in the Marlborough Sounds of New Zealand, Smiths Farm Holiday Park is the place for you. Smiths Farm in proud to offer a quality holiday and has been rated as 4STAR by Qualmark. Set in attractive landscaped grounds and within easy walking distance to the town centre, waterfront and swimming beaches, Picton Campervan Park is a small boutique holiday park featuring modern ‘chalet style’ Standard Cabins and Powered Sites exclusively for campervans and caravans (no tents). Our park is situated in both quiet and peaceful surroundings very close to the township of Picton. We are located in Waikawa, only 3½ kms drive away from Picton and off the main road, away from noisy traffic. The park is very spacious with plenty of bushy trees, grassy areas and many different species of native birds for you to enjoy. The tent sites and power sites are very roomy providing additional privacy and comfort. To cater for all visitor needs, we offer a wide range of accommodation options, from standard to self contained cabins. 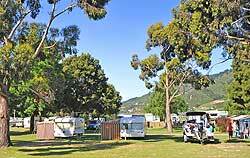 At Parklands Marina Holiday Park there is something for everyone.